Where are the best castles in the world? Which are the best forts in the world? What is the difference between castles and forts and fortresses? This post will answer all your questions around forts and castles of the world. The two biggest sources of inspiration for our travel stories are natural beauty and history. While I’m intrigued by the historical background and folklore related to places I visit, Chayan, my partner looks for the “views”. And what best combines both these interests than an old fort or castle built in a strategic location offering spectacular views from the top? Like us, many travel bloggers have the same affection for formidable fortresses. 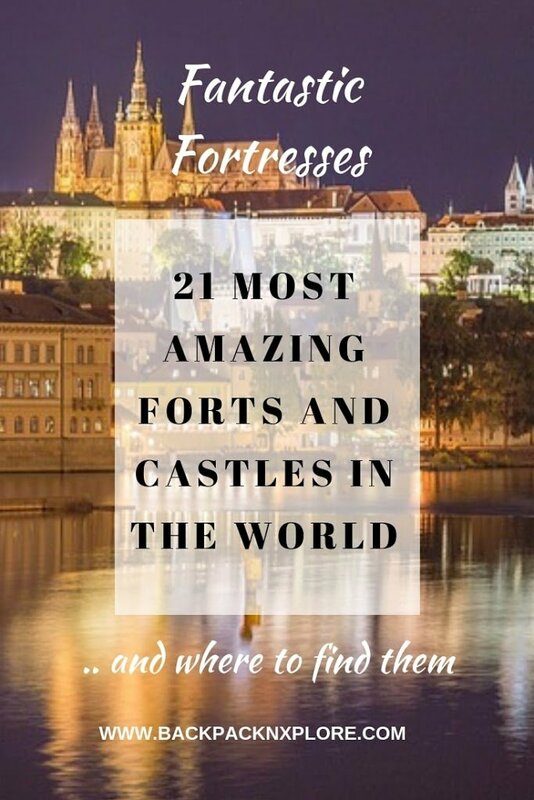 Thanks to them I am glad to present before you a list of 21 best forts and castles to inspire your adventures. After compiling this, my bucket-list has increased multi-fold as I want to visit all the best castles in the world. Some of these are special for their history, some for their stunning views and some for their artistry. Each one of them will take you back in time, will open before you a 3-D history book and offer you an unforgettable experience. What is the difference between Forts and Castles and Fortresses? A fort is a singular structure, a military stronghold which is the first line of defense for a kingdom. These are strong structures where the military forces used to reside and always keep a watch on intruders. The Forts may also include royal residences for the Kings who would visit and stay sometimes. A fortress refers to a fortified city or village, basically multiple fort-like structures surrounding a city. A Castle is similar to a fort except these were usually smaller and meant as a place of residence of the royal family and nobility. The term castle has Latin origin and specifically refers to a fortified royal residence in Europe and middle-east built during the medieval ages. So, in essence, it is a specific type of fort. Some also argue that the primary motivation of building a fort was to establish a military stronghold and defend a kingdom, whereas a castle was meant to be a place of royal residence which was also fortified, that is, built strategically to defend during wars and withstand a siege. Hope this answers the question about the difference between castle and fortress. So now that you know the technicalities, let’s get set to explore the most fascinating forts and castles of the world selected by passionate travel experts all over the world. You can click on the links in the table of contents above to jump to your place of interest, or simply read about all forts explored to choose your favorite. Choice of Claudia from My Adventures Across The World. Though there is a cable car that goes all the way to the top, the best time to visit is at sunrise, as the views of the Dead Sea at that time of day are simply impressive. As it is too early for the cable car to be open and functioning, the only way to get to Masada is a hike that goes along a desert trail and then up a long flight of stairs. It takes about one hour to get all the way to the top, and then around 45 minutes to descend. Make sure to start walking at least one hour before sunrise if you care to catch the views. The ruins that can be visited at the top include King Herod’s Palace, a Roman-style bathhouse which has mosaic floors. Contributed by Krix, the travel hacker girl. The town of Omis can be a great base for your holiday in Croatia. One popular activity is hiking to Starigrad Fortress. The fortress was built in the 15th-century with the intention to protect the town from the Turks who were at Bosnia and Herzegovina at the time. The only way to visit the fortress in by hiking to the tip of the 262 m hilltop. Your efforts will be worth it, as there is a beautiful view from the top to the Cetina river, the town, and nearby mountains. There are two ways to reach the top. A steeper route starts from the parking lot. I suggest going up this way and setting off early especially in the summer months to avoid the heat. The steep route goes through a forest so you will be protected from the sun. It takes about 45 minutes to get to the top. You will have to pay 15 kuna entrance fee. There are no facilities at the fortress, so make sure you visit the toilet before you set off and take plenty of water and suncream with you for the hike. We spent about 20 minutes at the top admiring the views and taking pictures. We decided to take the other route down for a different experience and as that was easier on the knees. The whole hike was 4 km, which can take 2-3 hours. I think it is a must-do activity for anyone in the area! The Forts Walk is always listed as a must-do when visiting Magnetic Island, even if it’s just for a short day trip. Magnetic Island is a small island 8km away from Townsville, on Australia’s northeast coast. 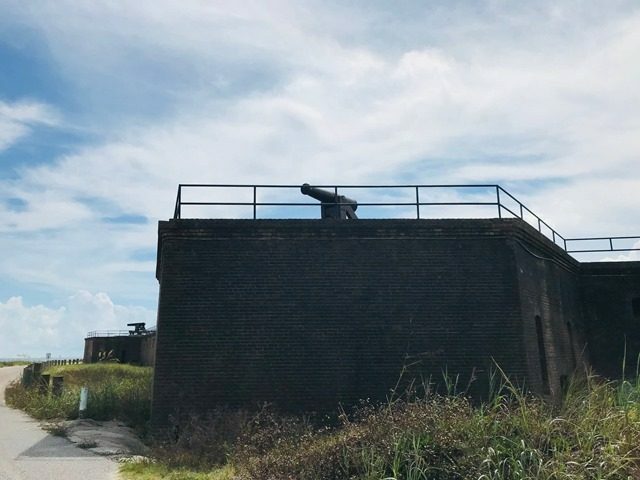 The walk will take you to WWII fortifications and infrastructures that were in operation from 1943 until the end of the Pacific War, in 1945. The Forts Complex is listed on the Queensland Heritage Register and is one of Australia’s best examples of WWII fortifications. The National Park website grades the 4-km return walk as moderately difficult and advises to allow 1.5hrs to complete it. Even if it seems excessive, it’s probably what it takes to explore fully the Forts Walk. Although it starts gently, there are many side tracks that will take some time as you check out to see some historical ruins to get insights about life at the fort during WWII. Then, the last part of the walk to reach the top of the fortifications is very steep. It wasn’t a problem to climb to one of the highest hills of the island for militaries, but that’s another story for tourists! However, it’s worth all the efforts. They added a bunker at the top of a rock on one of the highest hills to get 360-degree views to observe the surroundings. And this splendid panorama is not the only reason why the reputed hike attracts so many tourists and takes so long to finish. As you walk, you should regularly stop to look up at the trees. Wild koalas are often spotted near the path: we saw three of them! Golkonda is a famous historical fort originally built by the Kakatiya dynasty. It gained prominence after being occupied by the powerful Qutb Shahi dynasty in the 16th century when mosques were also added to the fort. This fort is located in Hyderabad city in Telangana, India. This fort is famous for being the home for many well-known diamonds like Kohinoor diamond. Just take a bus or auto-rickshaw from Mehadipatnam in Hyderabad to Ibrahimbagh and take an auto ride from there to the fort. You can walk up the stairs to reach the fort top and enjoy a beautiful view of the city. You can also see where poet Ramadas was imprisoned. Golkonda fort is also known for its mysterious acoustics. There is a wall inside the fort where if a person speaks, it can be heard at another distant part of the fort. This fort is being well-maintained now with sprawling gardens, but the fort has suffered ruin with age. There is a nominal fee to visit this fort, but it definitely worth it. Light and sound shows are also conducted seasonally. Golkonda was one of my favorite places to go with friends and family when I was in college. My college was very close to this fort and right in front of Taramati Baradari another beautiful structure linked to Golkonda fort, famed to be built for a gracious dancer. The Castle of Teutonic Order in Malbork (north of Poland) is the place for crazy castle lovers. Constructed by Teutonic Knights (German Roman Catholic religious order of crusaders) in the 13th century is the largest castle in the world by land area and UNESCO World Heritage Site. I took my Swiss boyfriend there as I knew he’s a bit addicted to castles. I chose the perfect place as Malbork castle is one of the most visited castles in the world. It is perfectly organized. We took an audio-guide with us (me in Polish, my boyfriend in French) and off we went. It takes around 5 hours (if you’re fast) to see all. Audioguide is a perfect solution. Everything is explained in detail, you wander through the whole castle and feel like you’ve been taken back in time. IT IS HUGE! But no worries, it is accessible for all, you do not have to be really fit. It is 5 + hours walking, but the easy tempo and you won’t even notice the time pass by. It is quite exciting to be in the largest brick building in Europe. The entrance costs 30 złoty. The Fortifications of Xi’an was built in the 14th century and is one of the biggest forts in the world. Incorporating pieces from the Sui and Tang Dynasties, Emperor Zhu Yuanzhang of the Ming Dynasty completed the structure over an 8-year period for defensive purposes. Since it is also one of the most well-preserved walls in the world, the trek up these forts is easy as pie. A few uphill steps will lead you to a 14km walking path. Bicycle rental services and sightseeing electric cars are also available as needed. Every 120m or so, a lookout tower sits steadily aboveground. At night, hundreds of lanterns and lights turn the whole place into a magical leisure site. “Dream Chang’an”, a remarkable performance showcasing Tang Dynasty etiquette, is put on display from Thursday to Sunday. The Xi’an Forts is equally a noted tourist attraction and an arena for local get-togethers. Elders are seen walking with their grandchildren, couples are seen holding hands, and friends are seen talking up a storm. This site is not only transportation back to the old days, but also showcases current Chinese culture, custom, and tradition. As a Xi’an native, I can easily spend hours wandering around these walls and examine the ever-changing landscape of the city! Bard Fort, located at the entrance of the Aosta Valley (Italy) is a unique sight, and one most people miss… as the area is definitely off-the-beaten-path. This fort, in fact, is regarded as the best example of early 1800 military stronghold in Italy. It is located in the village of Bard, where the valley is at its narrowest, between the Dora Baltea River and a vertical cliff. You may have seen it before, in “Avengers: Age of Ultron” where it is the seat of Hydra, the terrorist organization. In 1034, where the fort now stands, there used to be a castle. The actual fortress was built between the 17th and 18thcentury, by members of the Savoy family. Considered impregnable, until Napoleon Bonaparte arrived and put it under siege. Even then, it took him 2 weeks to conquer. Access to the fort is either by funicular or on foot, and it is free. There are three main defense stations positioned at different levels, five distinct constructions and 283 rooms. The fort has been turned into a cultural center and hosts 5 museums: The Frontier Museum, the Museum of Fortifications, the Prison, the Museum of the Alps and the Children’ Alps Museum – all of which have a paid entrance. It takes a full day to visit all the exhibitions, and each of them is of great interest. History buffs will love the first three museums, while the other two are all about mountains. We chose the mountains! The tragedy of the Civil War is felt as you walk the grounds of Fort Morgan and Fort Gaines as they take you back to a time when brother fought brother. Both forts were commissioned during the War of 1812 but only saw action during the Civil War when seized by Confederate forces and turned on their fellow Americans. The idea behind these twin forts was to cover the entire mouth of the Mobile Bay by building a fort on either side, with Fort Gaines to the west and Fort Morgan to the east. Unfortunately, neither fort could cover the extent of the bay, so Union ships laid siege to each fort individually until both forts were eventually overcome. With convenient parking nearby the hike to each of the two forts is easy and it only takes about an hour to see each fort. There are many staircases of up and down the walls, but you can limit the number of steps and still enjoy the forts. However, the most interesting way to see both forts is to take the ferry from one side to the other. With great beaches near Fort Morgan, you can combine your trip with a summer beach getaway, see one fort and then take the ferry across to the other. Fort Gaines is more intact and therefore gets more traffic, but Fort Morgan feels more authentic. Being a native Alabamian, both Fort Morgan and Fort Gaines are special to me because Mobile is my hometown. I love the history and slow pace of the gulf shores area. I hope you enjoy your visit as much as I always do. If you’re not accustomed to the southern heat, make sure to bring sunblock, a hat and plenty of water. Also, be aware the ferry only runs every hour and 15 minutes and cost is based on the number of people and/or cars. The ferry takes less than 30 minutes to cross the bay, so you could conceivably see both forts inside 3 hours. Rosenborg Castle, found in Copenhagen (Denmark) is a castle quite unlike anything else. Built in the early 17th century by one of the most famous Scandinavian kings: Christian IV, the castle is rich with history. What more, its beautiful red brick walls and tall towers are the perfect picture of Dutch Renaissance architecture, which means that the castle wouldn’t look out of place in a Disney Movie. It is one of the most beautiful castles of the world. For a price of 110 DKK, you can tour the castle’s well-preserved rooms that are a celebration of wealth. Walking through them, you will feel like you’ve journeyed back in time to Denmark’s period of absolute monarchy. This said, the highlight of visiting this beautiful castle is no doubt the chance to see Denmark’s Crown Jewels, which are kept here. The beauty of these ornate pieces is hard to put into words and they certainly put most jewelry collections to shame! So now I’ve convinced you to visit Rosenborg Castle, you’re probably wondering how to get there… Well, it couldn’t be easier as the castle is actually located right in the heart of Copenhagen. In this way, there’s simply no excuse not to visit Rosenborg castle when you’re in Denmark. Corvin Castle is one of the largest castles in Europe and is quite possibly the most impressive castle in Transylvania. The castle served as a fortress until the mid-15th century when it was upgraded to castle status by Iancu de Hunedoara, who took up residence. Corvin Castle is even considered by many to be one of the “seven wonders of Romania.” Corvin Castle is easily accessible by train and vehicle. The trek to the entrance is actually an easy walk from the parking lot, ending at the bridge which will take you to the impressive archway. One of the benefits of being tucked away in Transylvania is the lack of tourists, which means GREAT parking! Once you enter the castle, you are instantly transported back to the medieval ages with the gothic architecture and impressively intact structural integrity. If you’ve ever imagined yourself walking around the halls of King Arthur, watched Game of Thrones, or wished you lived in another time, Corvin Castle is perfect for you and worth a jaunt to the beautiful countryside of Romania. Climb towers to secluded rooms, discover the cells where prisoners were kept and fed to wild beasts and live like a medieval prince or princess for a few hours as you waltz around your kingdom. And if you’ve seen the recent blockbuster movie “The Nun,” take special note that a handful of scenes were actually filmed at Corvin Castle! Contributed by Jill, who’s Reading The Book Travel. When it comes to iconic forts, there are few as iconic as the Tower of London. First constructed in 1080 by King William I, commonly known as William the Conqueror, the Tower has played a central role in English life ever since. Lying on the bank of the River Thames, just east of central London, the Tower of London is easy to reach from the City Centre by metro or using one of the tourist boats which shuttle up and down the river. Once inside, discover the Tower through all the ages; from the 1000-year-old White Tower with its displays of armor to the Bloody Tower where the child king Edward V was believed to have been murdered in 1483. Check out torture instruments and execution blocks, half-timbered medieval houses and stone ramparts. Visit Tower Green, site of the execution of Queen Anne Boleyn, one of Henry VIII’s infamous 6 wives; check out the medieval royal palace; or visit the splendid modern-day Crown Jewels, still worn by Queen Elizabeth II on royal occasions and guarded to this day at the Tower. Over the years the Tower of London has been a palace, a prison, and even a zoo; today, the fortress stands as a monument to English splendor and heritage. And the secret of its survival? The famous Tower ravens. It is said that as long as these black birds call the fortress home, England will never fall. What do you think? Is this the best fort in the world? Oman is known for its grand fortresses, castles, and towers, which were erected to defend the wealthy Arabian nation from intruders and conquistadors. More than 500 structures survive today, spanning all the way from Oman’s coastline to the edge of the country’s vast desert interior. Nizwa Fort is one of Oman’s biggest and most historically important fortifications. It is one of the biggest forts in the world. Its rounded shape makes it unique among its peers. Inside, the fort is a maze of corridors, prayer rooms, storerooms and living quarters (it was once home to the local Imam and needed to be big enough to house an entire army during enemy raids). Today, the inside of the fort has been refurbished to include a museum. Along with seven interior wells and strategic openings where soldiers would stand in defense, one of the more macabre design features of Nizwa Fort is its ‘murder holes’. Soldiers would patiently wait above the slits in the stone floor with pots of boiling hot date oil. When an unwelcome intruder appeared beneath, they would pour the oil through the hole, well and truly thwarting their attempts. Nizwa Fort is located in the heart of Nizwa, right next to the incredible Nizwa Souq. Although you don’t need to trek to get up to the fort, there is a fair bit of walking involved in exploring the structure itself. The huge rooftop terraces and zigzag staircases are particularly enjoyable to walk around. The geometric shapes of the fort’s walls cast intricate shadows over its beautifully textured, sand-colored saruj plaster—an adobe-like covering made from local clay that gives Nizwa Fort its appearance of emerging from the surrounding stony hills. Alamut means eagle’s nest and is the name a Persian king gave to his fortress after he followed an eagle that landed on top of a hard to reach the mountain in a valley in Northwestern Iran. He decided that this was the perfect location for his castle. The mountains formed natural protection and from his castle, the views extended over the valley and beyond. The castle came in the hand of the Assasins, a secret Islamic sect that fought against the ruling Seljuks. The castle flourished in this time and was completely self-sufficient with an irrigation system and gardens. They also built a giant library and center of learning. Alamut was conquered by the Mongols who destroyed the castle. What remains nowadays are ruins that are still difficult to get to. 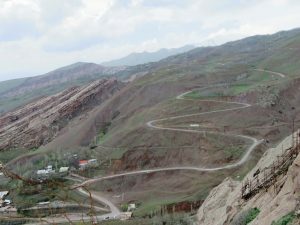 What remains the same though is the stunning beauty of the mountains and the magnificent views over the Alamut valley. It is a steep hike up the mountain where the ruins are, but the hike itself is worth on its own. Not much people make it up here and the silence of the mountains is incredible. The one hour hike can easily become 2 hours if you allow yourself to take frequent breaks to take in the beauty of your surroundings. The ruins can be a bit disappointing, but the views will for sure leave you breathless if the hike didn’t do that for you already. Besides the Alamut castle, there are much more hikes in the area and therefore I would recommend a day or two in Gazor Khan. The perfect place to experience Iran’s hospitality and get a sense of rural life in the mountains. Gazor Khan is only 4 hours by taxi from the city of Qazvin. Just don’t forget to bring your hiking shoes. Never heard of Fort Charles? Chances are you have, you just didn’t realize you did! If you’ve ever watched any of Disney’s Pirates of the Caribbean movies, you’ve definitely encountered this old Fort in Jamaica. It’s where Captain Jack Sparrow first landed his derelict ship in search of a crew & was the main naval base for the pirates & their ships. Fort Charles’ history stems all the way back to 1655 when the British first captured the island of Jamaica from the then ruling Spanish. The fort was constructed to protect the island from being recaptured by the Spanish & eventually became the richest harbor in the western hemisphere. Sadly most of the fort sunk in an earthquake that ravaged the island in 1692. Today the remaining areas of the fort served as a museum for visitors to marvel at the might & power that once dwelled behind these brick walls. Canons jut out from these brick walls warning off any looming invaders. On property, too, are old architectural structures that were used by the pirates as storage rooms. To get to this historic gem, a 15-minute bus ride from Kingston’s main airport, the Norman Manley International Airport will land you in the town of Port Royal, where you’ll find the entrance to this Jamaican attraction. Contributed by Penny from Globe Trove. One of the most beautiful forts that I visited during my vacation in Sri Lanka, was the Galle Fort. Unlike many forts, this one did not require a trek up! Which meant that it is easily accessible to people of all ages and fitness levels. In fact, you can actually drive a vehicle into the fort if you wish. 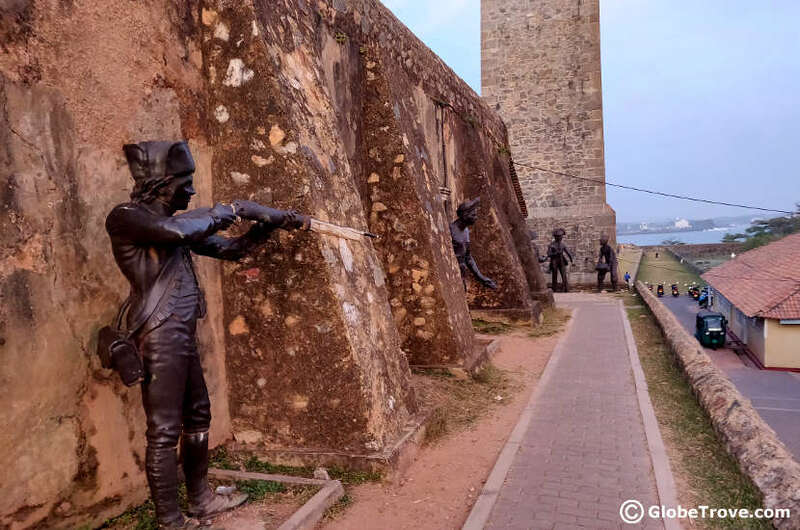 The Galle fort was originally a Portuguese fort which was used to guard the coast of Sri Lanka from invaders. It was later taken over by the Dutch. Today, the fort is a popular tourist spot that is famous for its European architecture, peaceful lanes and a gorgeous view of the sea. What can you do when you visit? Well, there are a couple of sights that you can see which includes a lighthouse, a clock tower and a number of religious structures. Our favorite spot, however, was the fort walls where you could look out at the sea and listen to the lapping of the waves on the rocks below. If you are heading to the southern coast of Sri Lanka, this is definitely one of those places that you should think of stopping at! Contributed by Alison from Museum Travellers. Château de Grandson was built between around the 13th century and it’s recognized as a Swiss heritage site of national significance and is one of the best preserved medieval fortresses in Switzerland. Located between Neuchâtel and Lausanne in Switzerland, there are lots of options to get to Chateau de Grandson. It’s accessible by car, bus, and train. There are two car parks in front of the castle or there is a large car park at the back of the castle, which is suitable for motorhome parking. 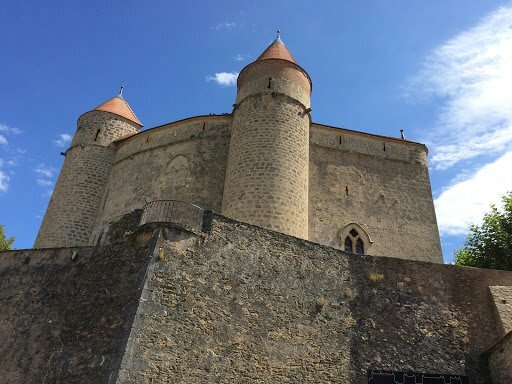 Grandson also has a train station, which is a short walk from the castle, as well as four bus routes (all departing from the town of Yverdon-les-Bains) which stop in front of the castle. I would allow 90 minutes to 2 hours for a visit. Please beware, like most castles, there are a few steps, especially in the turrets, and it’s not stroller or wheelchair friendly. But it is not an overly difficult walk. The castle is a classic walled fortress style with four turrets and visitors can walk around the internal walkway at the top. For me, the parts I love the most is the view over Grandson and Lake Neuchatel from the top of the castle, it is truly magnificent regardless of the season. The Old Town of Kotor in Montenegro is surrounded by fortifications that originally date back to the 6th century. The defensive walls have had different purposes and received their current structure in the 15th century. Today, Kotor and its fortress are part of the UNESCO World Heritage Site list, namely because of the integration of the fortress into the landscape. Climbing the city walls is one of the must-do activities if you find yourself in Kotor! It is the perfect way to see breathtaking views of the city and the stunning Kotor Bay. Depending on your own preferences, you can choose a different trek, and you do not need to cover the whole walls to get some truly beautiful views. However, if you’re healthy and well prepared with water and comfortable shoes, getting to the top shouldn’t be a problem. It will take you around 2h to do the hike, though timing depends on your pace (and the amount of time you stop for photos!). It is a steep climb (there are over a thousand steps to help you along the way) at times but even in its worst parts difficulty is only moderate. At the top, you’ll find St. John’s Fortress, also known as the Castle of San Giovanni. This one of the most beautiful hikes we’ve ever done in our lives! The views to Europe’s southernmost fiords are what travel-lovers dreams’ are made of. Words of Priyanka from On My Canvas . Follow her on Instagram. This 900-year old golden beauty is in the middle of the desert town of Jaisalmer and is a must see for anyone visiting the city. While you walk around the fort, its intricately carved doors, pillars, galleries, and colorful windowpanes would not let go of your attention. The stone carvings in this fort, like many other in India, are too special to miss. You would wonder how the artists carved such detailed figures centuries ago, without any modern tools and under the scorching sun. When I made my way up the fort and looked at the yellow city of Jaisalmer sprawling in and around the fort, I couldn’t bring myself to come down from the top. The guards answered all my questions; so talk to them as they and you both admire this human-made wonder together. I was lucky to witness an Indian wedding while having a rooftop dinner in a restaurant in the fort. Maybe you could be fortunate, too? And if you ask around, you might find the house of the old lady who cooks a typical Rajasthani meal as per your taste to keep her livelihood going. The walk around the fort wasn’t strenuous, though the glowering sun and the huge number of visitors did make the walk a bit tiring sometimes. But then you can choose an artistic windowsill and relax while soaking in what you have already seen. Jaisalmer is just a train, bus, flight, car ride away from Delhi, where you can fly from anywhere in the world. Edinburgh Castle sits on the remnants of an extinct volcano, which last erupted over 365 million years ago. There is evidence of Iron Age settlers living on Castlehill long before the castle we see today was fortified. St Margaret’s Chapel is the oldest building in the castle and is also the oldest building in the whole city; dating back to 1130. There are many historic gems to be discovered inside including the Great Hall, the crown jewels, and the Stone of Destiny. The castle sits at the top of the Royal Mile in Edinburgh’s Old Town. Castle Rock is the crag of the volcano, and the Royal Mile is the tail; the valleys on either side – Princes Street Gardens and the Grassmarket – were carved by glaciers during the last Ice Age. There is a continual gradient on the walk to the castle, however, the walk is easy and takes just 15 – 20 minutes from Princes Street in the city center, or from the bottom of the Royal Mile. My favorite thing about the castle is that its elevated position offers unrivaled views of the stunning city skyline from the Half Moon Battery and ramparts; you can see Arthurs Seat, Calton Hill, the sea, and lots of Edinburgh’s enchanting old architecture. A list of greatest forts and castles to explore cannot be complete without the mention of the largest castle of the world, according to Guinness Book of World Records – The Prague Castle, located in the picturesque Bohemian capital, Prague. Malbork Castle is the biggest castle of the world by lad area, while as a castle complex, Prague castle holds the record. A 9th-century monument which served as the seat of the Czech royalty and then Bishop and currently the official residence of the Czech President, the castle complex spans over 70,000 square kilometers. The complex consists of grand palaces, many Christian buildings, and a beautiful garden. The golden period of the Prague Castle was when it served as the seat of Roman Monarch, King Charles IV in the 14th century. Arguably the most iconic landmark of Prague, getting to it is not difficult at all. It is right in the city and you can reach there via several metro rail routes. Most areas of Prague castle are wheelchair accessible too. This is another place which I have not visited, and most people may not have even heard of. I got to know about it while searching for the largest fort of the world, and I believe this has to be included in the resource I am trying to create for all fort lovers. Also known as the great wall of Sindh, the fort extends over a circumference of 35km connecting several mountains. 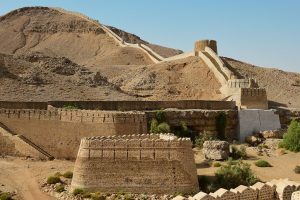 The origin of the fort is unknown but archeologists concluded it to be dated at 17th century during the rule of Baloch emperors. “The size of Ranikot defies all reasons. It stands in the middle of nowhere, defending nothing,” writes Isobel Shaw. To visit and explore this grand mysterious structure built entirely out of stone and lime you have to take a flight to Karachi, from where it is a 6 hours drive to Ranikot. Official tourism sites recommend hiring a 4-wheel drive for exploring the ruins of Ranikot. I am definitely intrigued the more I read about it and look at the pictures. The decapitated fort is a mere shadow of its former grandeur for sure, but it certainly looks worth exploring. How did you like this virtual tour of fortifications around the world? Thanks to all my fellow bloggers and travel enthusiasts who collaborated with me in putting together this amazing list. Have you ever trekked to a fort, or explored a castle? Which is your favorite of the 21? Where would you love to go? Tell me in the comments. Disclaimer- All pictures, unless otherwise mentioned are sourced from the respective travel writers. Awesome list. I'd love to go to every one of them! It's fascinating how they all look very different, despite sharing similar purposes. My favourite thing about forts is definitely the panoramic views. And the views from St John Fortress in Montenegro look amazing so I'd love to hike up there. But I've also never seen anything like Xian Forts so I'm super curious about this one. So pleased I found this. I love visiting forts and castles and there's a whole load here, I've never even heard of. Thank you!! thanks a lot. Edinburgh is on my list too! This is the most comprehensive castle post I've ever read! I've never heard of most of these! Wow this is a very awesome list from real travelers. Genius. Thank you for featuring castles outside of europe which are very popular, and showing the lesser known but equally impressive castles in other parts of the world. I have always been fascinated by old castles and fortresses. There is something so otherworldly and intriguing about them. You have such an awesome list of castles here and I hope to visit them all one day. What a great list of forts, fortresses and castles. Plus you’ve covered more than just Europe, although Europe has lovely options, we forget that these are found everywhere. I’m especially grateful for the inclusion of details such as how to get there (although I’m not sure I’m up for 5 hours of walking!) and the costs associated. Thanks for putting this list together. Really cool collaboration. This is great. So many places that I'd love to visit someday. WOW thats a lot of castle on one blog post. Must have taken a while to collect all this together, good job. I've never been to Montenegro so I think thats the place I'd like to tick off next. I too love forts and castle as they give a nice glimpse of ancient living of that particular place. Loved the detailed list of all the fascinating forts or castles and thanks for sharing it. Malbork castle in Poland is looking stunning. Nature and heritage are two of our favourites too when it comes to travel. Forts and castles always make for an enthralling subject. The stone and mortar walls of these structures hold so many fascinating stories waiting to be told. This is a nice idea for a collaboration and loved reading about forts and castles from across the world. When it comes to forts, we have a special corner for the forts of Rajasthan like the Amer Fort in Jaipur and the Jaisalmer fort. Thank you. I am thankful to all the collaborators! Thanks. I learnt a lot too! I have always dreamed of being a princess so, I guess it is about time to explore the castles around the world. The Malbork Castle is just wonderful and it would be my dream to visit one day. Bookmarking your post for future reference. So happy to discover fascinating forts and castles from around the world! Have seen Edinburgh Castle, Scotland, Jaisalmer Fort, India (and some more there) and Tower of London, UK from here! Have a big list to cover and will use this as a reference guide! I also share the same love for castles! Likewise, it’s because of their history and their exquisite architecture and decor. 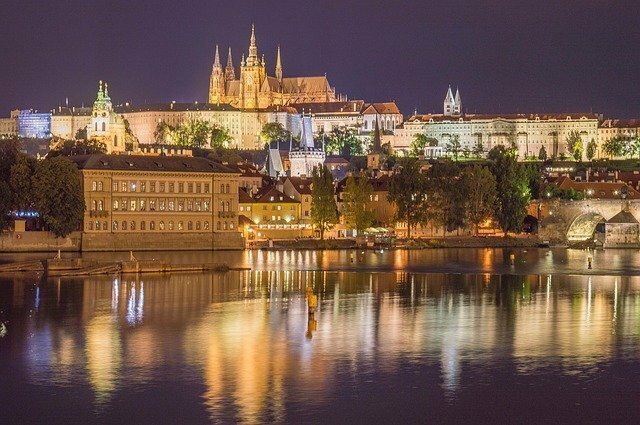 You have a great list and these destinations would make an awesome addition to a travel bucketlist, especially the Prague Castle! The Edinburgh Castle actually reminds me of Hogwarts in Harry Potter. I definitely want to visit Malbrok Castle in Poland. It's huge and beautiful. The 5-hours tour made me think this castle have tons of history behind the wall to rediscover. Intriguing! What an awesome list of castles and forts! It's wonderful to see a few I've visited too, namely Castello di Bardi in Aosta Valley and the Tower of London. I'm so intrigued to visit the one in Poland, it just looks like something out of a fairytale. I really enjoyed reading this, and hope to visit more of these places in the future! I learned a lot about Forts and Castles from this article! There are so many fascinating places on this list, and I only visited Prague Castle haha. 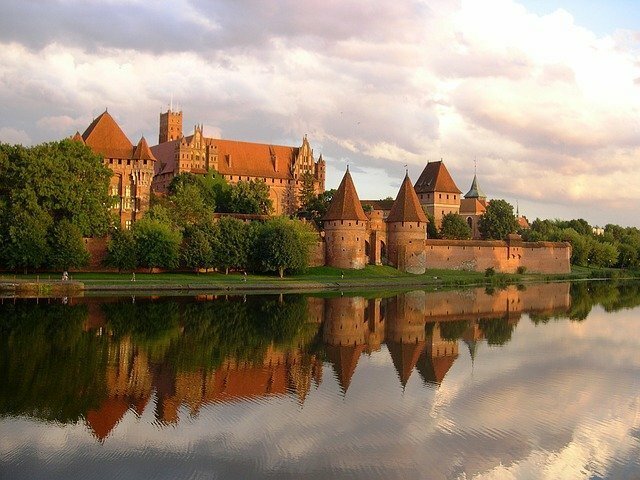 I would love to go to Malbork Castle as it looks dreamy. The view of St. John Fortress is definitely one of the reasons to go there as well. Great list and thank you for sharing. What an amazing list of forts, fortresses and castles. I love that you also covered all the details, especially describing how to get there. I visited more than half of these castles and out of all, the one I want to visit the most is the Malbork Castle. Whoa! That's an awesome list. Happy that I've been to 4 in this list! I really have to head to Croatia! It looks fabulous. I looove this post! It's so full of inspiration + useful tips! I'll save it for later, as I'm planning a big trip for next year. Hope I can visit most of them! This is such an original list! So far I could check off the Towers of London, Jaisalmer Fort and Prague Castle. Still a long way though to complete your list but hopefully one day I could see them all! What a great list! We are planning to go to Israel, Montenegro, Italy, and Croatia this upcoming summer for our RTW trip and I'm definitely keeping this list handy! What a great post with so many information> i am going to Denmark soon and the Rosenborg castle is on my list! An interesting roundup/collab all of you put together. It is quite interesting to discover new places – I'm kinda amazed though that noone mentioned a single German castle. How come? I've only visited 2 of the castles you've got on your list, hopefully I can get to the other 19 one day. Castles and forts are so much fun to explore, they have so much history to tell! A great compilation of forts to visit! There's something so compelling about forts, their history and the stories the walls could tell! We've been to just four on your list but look forward to exploring many more! Thanks! This is amazing. I have never been interested in forts or castles. But you have presented the list is a fascinating mamber. And also thanks to educate us about the difference between forts and castles. Very, very cool post though. Can I visit all of them please?! I love castles and this looks like a superb guide to castles around the world – wonderful compilation. Thanks for sharing this post. This is really a great list. I love to discover historical places and you have given me an amazing list. Your blog make my bucket list so long. Thanks for sharing wonderful list of all castles and forts around the world. I loved to see that Xian Forts of China as I have never seen any Chinese style castle or fort. It is good to understand all the ancient history when we visit castles and forts as they reflect all the ancient culture. This is a very good combination, loved the idea! My best looks like Aggies Switzerland! I like castles, feels like you are in a time machine! I really liked this, because you don't only get to learn about lots of forts and castles from all over the globe, but you also see the diversity of other people's choices, each with their own personality. It was a great idea to put all of this together in one spot! Wow.. i am yet to explore that. Do you know Jaisalmer fort is still an active fort in india? Thanks so much Zenja! Europe indeed is the hub for castles. In india however we have more forts to offer. What a great collection and what a great idea to collect from other travel bloggers so you were able to get a really comprehensive list – Fabulous post! I don't believe there is anyone out there who is not fascinated by castles and fortresses. I know I love them and I'm never tired of them. Thank you for this amazing list! I've only been to only a few on your list, for example Corvin Castle. During our Transylvania road trip we visited quite a few castles and they were all magical! Loving this collab! There are so many amazing castles and I love hearing about the history of them! What an amazing list of beautifully unique places! I love the Edinburgh Castle high on the hill top- what an amazing view that would be! I am also in awe of Rosenberg Castle in Denmark. I would love to walk through its gardens and feel as though I have gone back in time. Thanks for sharing – I’ll save for later! What an amazing compilation of forts and castles around the world. Love it! I have been to a few of these. I thoroughly enjoyed the gardens of Rosenborg Castle in Copenhagen. The well manicured lawns and trees were stunning , even in the winter. I can only imagine how beautiful they would be in the spring. Enjoyed Prague castle too although the walk across Charles Bridge and up the hill was the best part as you got a wonderful view of the city. Great list! What a great collection of forts and castles. Perfect ide for a collab post from other travel bloggers. Out of the list I have been to just 7. So many yet to explore. I’ve been to 5 of these but never known the difference between a fort and a castle! I love these kinds of places but they usually have lots of steps and my knee problems prevent me from enjoying them fully. I look forward to visiting more of them! This is definitely a good compilation. Have you visited all of these forts, fortress, and castles? It is amazing to know that they still exist after all these years. Thanks Blair. I have been to many forts in India, but this list is selected by travel bloggers all over the world. I have always wanted to visit Rosenburg Castle in Denmark. It looks amazing! I’m not sure if yiou have visited Fort Santiago in the Philippines. I think it’s worth the visit too! Such a pretty and historic place. What a great list! Sadly I have only seen three of these so I may challenge myself to visit all of them. Where to start first? I am intrigued to visit Edinburgh Castle as my heritage is Scottish so I think I would start the challenge there. Thanks for the list.